Here's my Kourageous Meadow Clary finished. I had it completely finished Wednesday. This block is my April 2011 UFO with Judy's Patchwork Times. Here's a photo of Kourageous so far. I've got four blocks complete...bring on May's challenge! First let me share with you Meadow Clary that is my April UFO with Patchwork Times. This design is one of Claudia's. I have it all done with days ahead of the April 30 due date. There were 21 sections and 99 pieces in this block. Don't you just love it? It is the fourth block of a 12 block project that is Kourageous. This is what I've got so far. The top left is designed by Linda Causee. The other three are all Claudia's. The remaining designs are from various designers; it just seems that the random generator at Patchwork Times likes Claudia right now. Not sure how I'll set all of these blocks when they are all done, but it's sure to be something grand! I wonder what number will be selected on Sunday May 1 for my next flower. You can find out what flower might be next by the link above under Kourageous. If you haven't heard yet...mark your calendar for May 2-6 for the Quiltmaker 100 Blocks Volume 3 Blog Tour. This is a very prized magazine issue to own. And if you take the tour you could win some very nice prizes. The issue goes on sale at quilt shops and local newsstands around May 10. I'll be busy in the next few days on my first ever Quilt Guild Lecture that's on May 10 at Sunshine Quilters. My focus is on being published and I'll have a trunk show too. The next project will be Part 2 of Secret Window's blog post scheduled for May 20. Karousel is done and will go in the mail tomorrow. I'll have pictures of this cute baby quilt to show you very soon. Next up on my sewing table is another 2011 UFO, Komfort Kove, with pictures on my Design Wall this coming Monday. Come back soon, happy sewing! These three need labels. Katching Kisses on top, Kotton Kandy Kocktail next, and Krimson Khat on the bottom. I've also got the label ready to put on Kandy Korn and Karousel (both not pictured). I'd have had these labels on already but was trying to print as many as I could on one sheet of the costly Printed Treasures fabric sheets as I could. Last up and unfortunately not too much progress today is my #4 UFO Meadow Clary block for my Kourageous project. April 30th is the due date for this block. It is coming along nicely. A total of 99 pieces made into 21 sections for a 6" finished block! 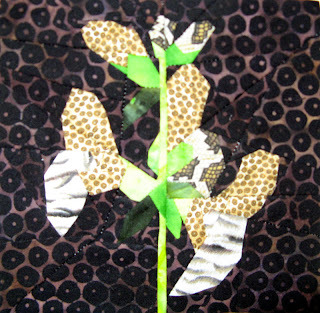 I'm using primarily snake skins for this flower. If you want to be inspired further I suggest you check out other design walls at Patchwork Times. Now back to sewing! Have a great week. Today I've got my #4 UFO with Patchwork Times to work on. It will probably take most of the time I have today to finish it. I'll be in pretty good shape as there's one whole week left in April to finish it. I finished the QM Sea Horses pattern for Leah's baby shower gift. It has come out so cute. Instead of the template in the pattern I was able to use Kaye England's Nifty Notions Half Square ruler; sure made the cutting lots easier! It is on Kerry's long arm machine now...binding all set. I know she'll just love it. I've learned the baby's name and will put it on the label--but I'm also going to hide the label just in case Leah doesn't want to share her name until after she's born. After all it is her surprise to reveal. I think I've done okay with all the colors. Grandma says most of the colors match the nursery! So how did you do using your stash this week? 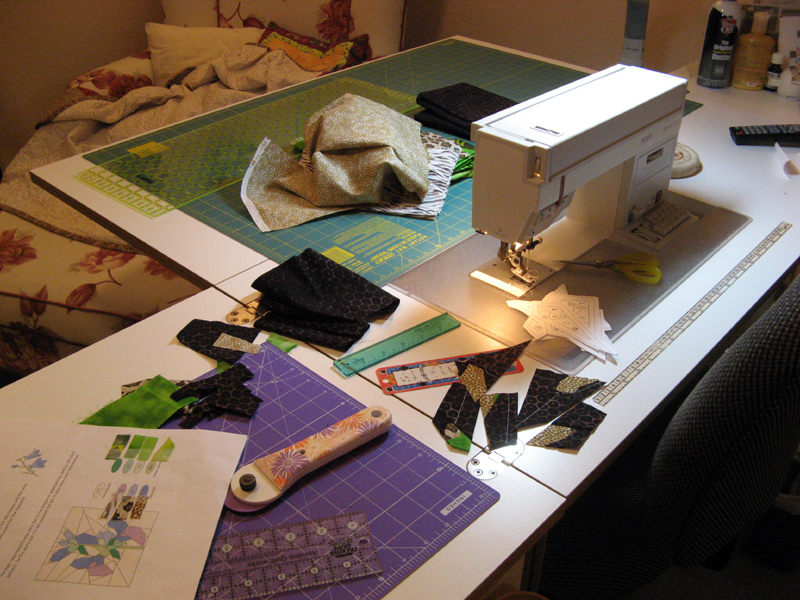 Here is what I've got going on in my sewing room! 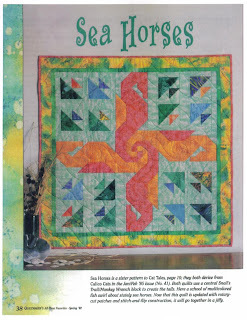 First up is the cute Sea Horses pattern from Quiltmaker All-Time Favorites Spring 02 issue. This project is being done for my niece Leah's first child, a little girl I'm told. There is a baby shower on May 7th in Virginia that I won't be able to attend, but this gift will be there! I pulled all the fabrics from my stash last night. The blue and teal fabrics on the left are for the body of the fish, the next five prints starting with the multi color are for the fish tails. All scrappy just as I like it. The top right fabric is the background. The blue and raspberry print fabrics are for the sea horses. I'm nervous about having enough of the blue. It will take some fancy cutting to make it work. Last two fabrics are for the inner border (raspberry) and outer border. It should turn out so cute. I'm going to see how it looks before I decide on a binding fabric. I've got my sights set on a Friday night completion. Next up is my 4th 2011 UFO with Patchwork Times. 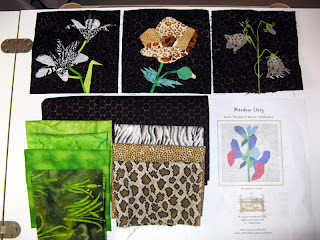 I'll be making a Meadow Clary with these fabrics. The top 3 are what's been made so far. The light animal print will be where you see red in the pattern. The other 2 gold prints will be for the purples; the light purple being the small gold print. The 4 greens for the stem and leaves. 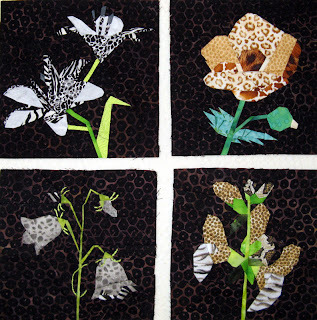 A Claudia Hasenbach design from her Series "Big Quilt of Nature - Wildflowers". I hope to start and finish on Sunday. Hope you are having fun this week in your sewing room. This is what kept me occupied until midnight! All done for showing the designer Cathy Farris tonight. She's our guest speaker at Canyon Quilters April monthly meeting. Check out other inspiring designs today and every Monday at Patchwork Times. I purchased five yards of a green leafy batik for a 2011 UFO fabric. A positive purchase! Did have quilte a bunch that I can claim as used. I finished my Lakeside Mystery II! Just in time for Cathy Farris tomorrow at Canyon Quilters April monthly meeting. I have so much going on right now it's getting difficult to figure out what's next. I've been working on deadlines first certainly. Last week I was getting ready for my Part 1 - Scrappy Cutting and Sewing blog post for Quiltmaker's 2011 Mystery Quilt-Along that is being hosted on Quilters Club of America. This post is available today. Check out the action there and sign up FREE if you want to quilt-along. I'd love to have you join the group where I'm the host! 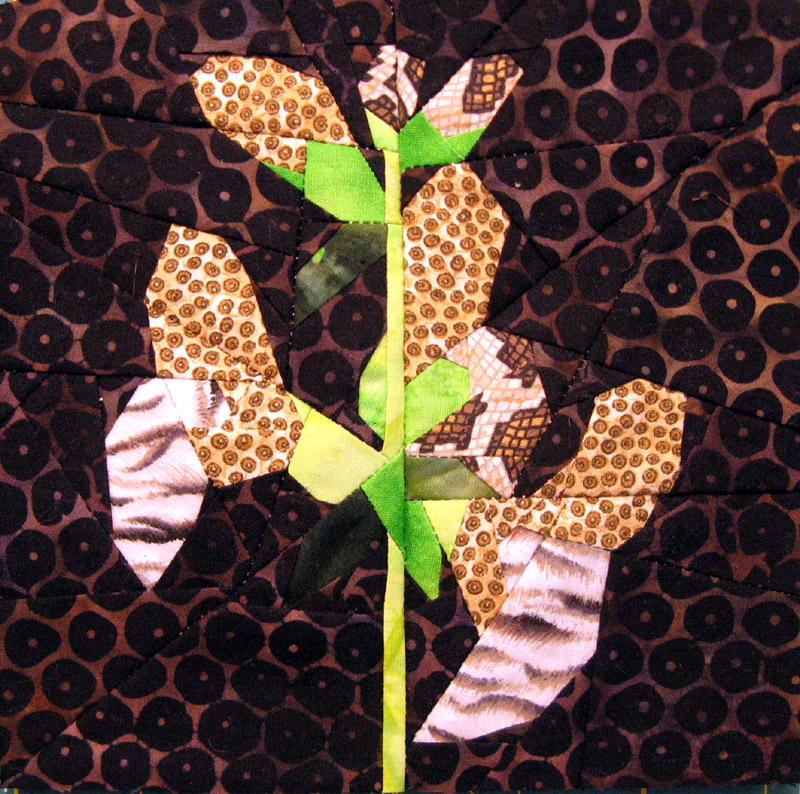 Hoffman Batiks are my fabric line with the Quilt-Along. I'm also making a second project using red, white, and black fabrics that I'll show the end results of each part here on my blog. Here's how Part 1 ends. 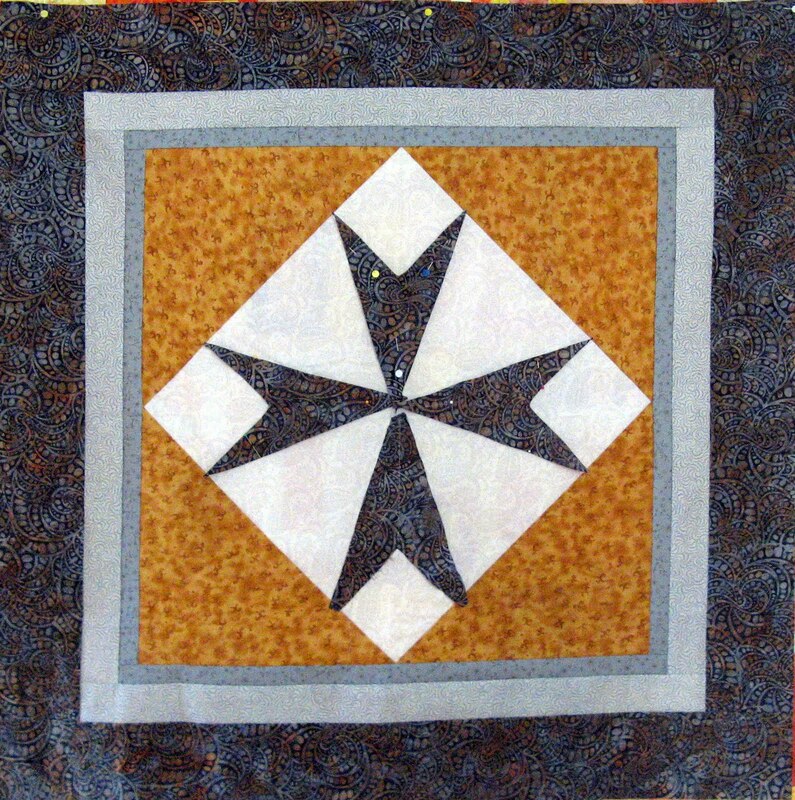 The next project I needed to get done is the BOM for my quilt guild Sunshine Quilters April meeting that is tomorrow. This is called Flower Patch. The flower block will be used for the middle and the snowball green block will be for the winner to use in the border. Here is Kandy Korn all finished. This is a Judy Laquidara design called Peaches and Dreams. Some of you may have helped me with this quilt's name. Originally I'd thought to call it Kreamed Korn, but Kandy Korn definitely sounds more appropriate. Next up is a quilt that I've yet to name. I'm trying to have the top done by next Monday because it's a pattern by Cathy Farris taken at a workshop in January called Lakeside Mystery II at the 2011 Road to California Quilt Show. Cathy Farris will be our guest speaker at Canyon Quilt Guild the April meeting. I'm appliqueing the center medallion called "Orange Blossom" right now. I have all the borders done. It may not be finished but I'll be taking it for Show and Tell one way or another! If all of this isn't enough...did you see the Better Homes and Gardens American Patchwork and Quilting June 2011 Issue? Starting on page 30 there is another pattern I want to make. I've got loads of stash green and ivory I want to use...red might be a trip to the quilt shop, but this one just has to be made! It's called Twist on Tradition by Avis Shirer. I also have lots of Bonnie Hunter bonus squares already sewn to be part of this gorgeous design. And of course another Bonnie Hunter pattern in the May/June 2011 Quiltmaker Issue called Lady of Lake Erie is screaming to be made. Again I've got those bonus squares and a huge selection of blues for this one popping out of their storage bins ready to be sewn. 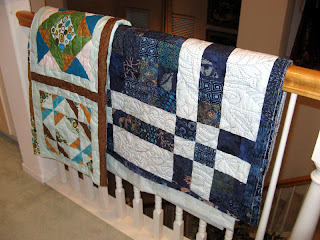 Check out other design walls by other fabulous quilters at Patchwork Times. For those who asked...I'm just about finished with the foundation piecing tutorial that I assembled while making Dances with Waves. Perhaps by Wednesday I'll have something posted. So for my report this week. Dances with Waves project is now in queue with Kerry's Quilting. A bit late for Make-A-Blanket Day, but I'm sure Project Linus won't mind. Thanks Quiltmaker for another year of supporting Project Linus' cause. For the complete pattern go to www.quiltmaker.com/projectlinus. Today is the day! 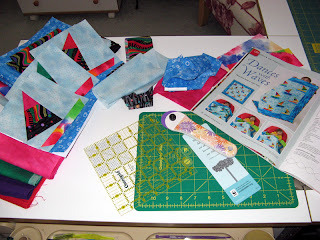 The Quiltmaker Quilt-Along Mystery 2011 starts today. I will be hosting the Quilt-Along for Quiltmaker. Part 1 will be split into two parts. Part 1 - Introduction will be available on Quilters Club of America (QCA) today and Part 1 - Scrappy Cutting and Sewing will be available on Monday, April 11th at midnight PST. 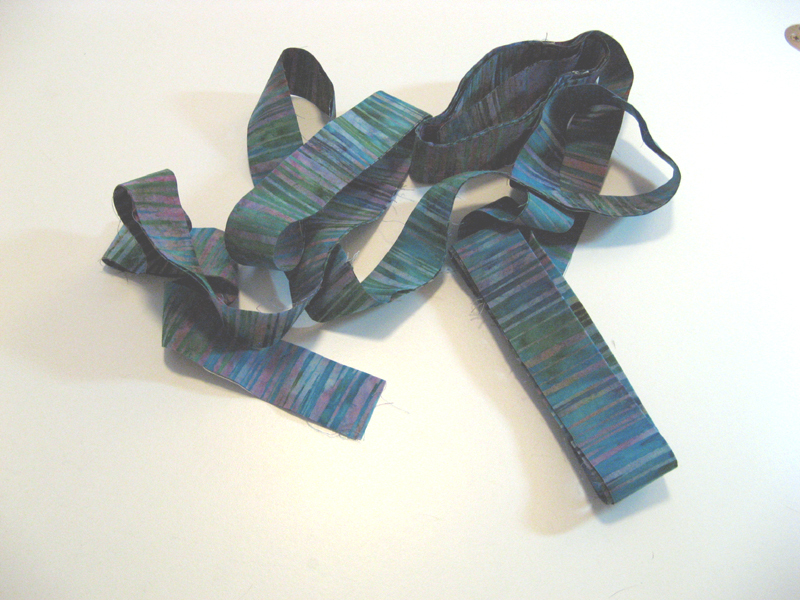 On the QCA site I'll be showing a scrappy version using mostly Hoffman batiks. I'm also making a scrappy red, white and black version that I'll be showing on my blog. 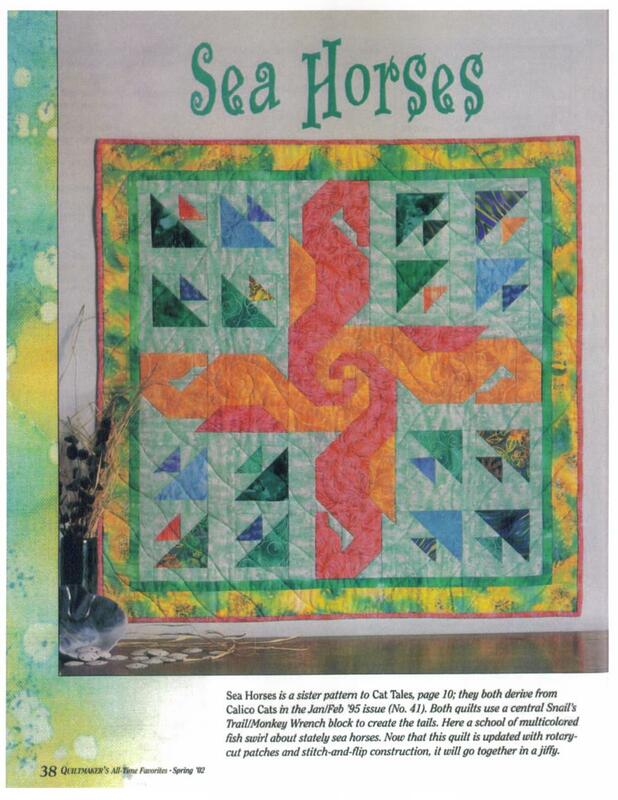 If you are feeling like a fun mystery project pick up the Quiltmaker May/June Issue #139 and quilt-along. Hey, when you get the magazine fill out one of the subscription cards and send it in (or go to Quiltmaker to subscribe online) because you'll need the next two issues to complete the mystery project that will be released in three parts. You won't be disappointed in a subscription with Quiltmaker. I've been subscribing since 1999 and have made numerous quilts from their patterns. I have my collection of magazines and refer to them constantly. Whether you decide on the subscription or not you will need the July/August Issue #140 and September/October Issue #141 to complete this mystery. The subscription will get the magazine in your hands usually a week or more sooner than newsstands--and at a better deal too! Come join in on the fun at QCA. You'll have to join the Quiltmaker Quilt-Along Group. It is absoultely FREE. Today I have Dances With Waves on my design wall. 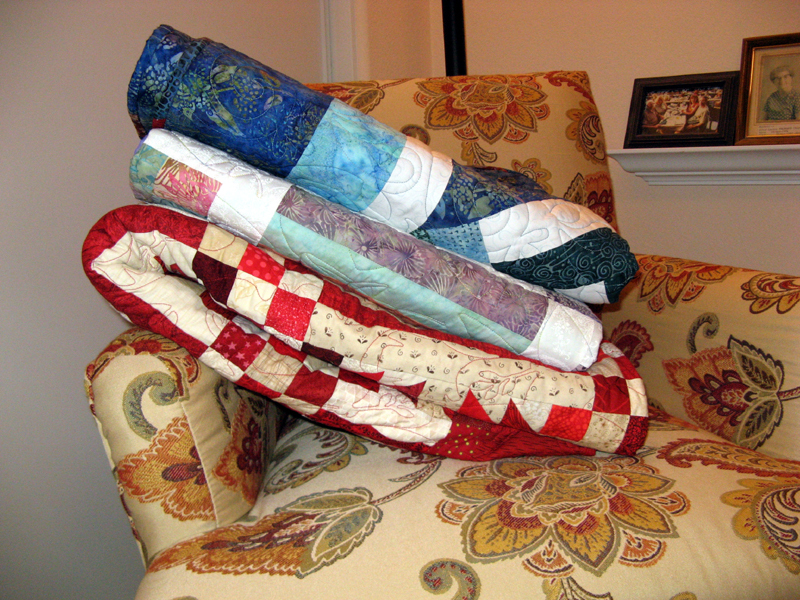 This is the Quiltmaker pattern for 2011 Make-A-Blanket Day campaign for Project Linus. I've made each one of their patterns to support Project Linus since I can remember. 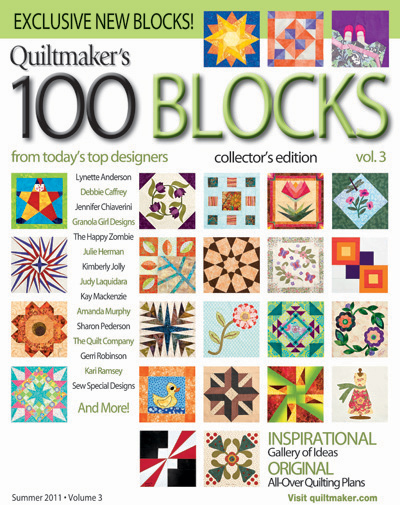 You can go to their website www.quiltmaker.com where all the patterns are offered for FREE! I'll be using the blue "bubbly" fabric for all borders and then either the boat fabric or the bottom fabric of the sail as the binding. It will be something from my stash for the back. First though I've got to pull off the paper foundation! 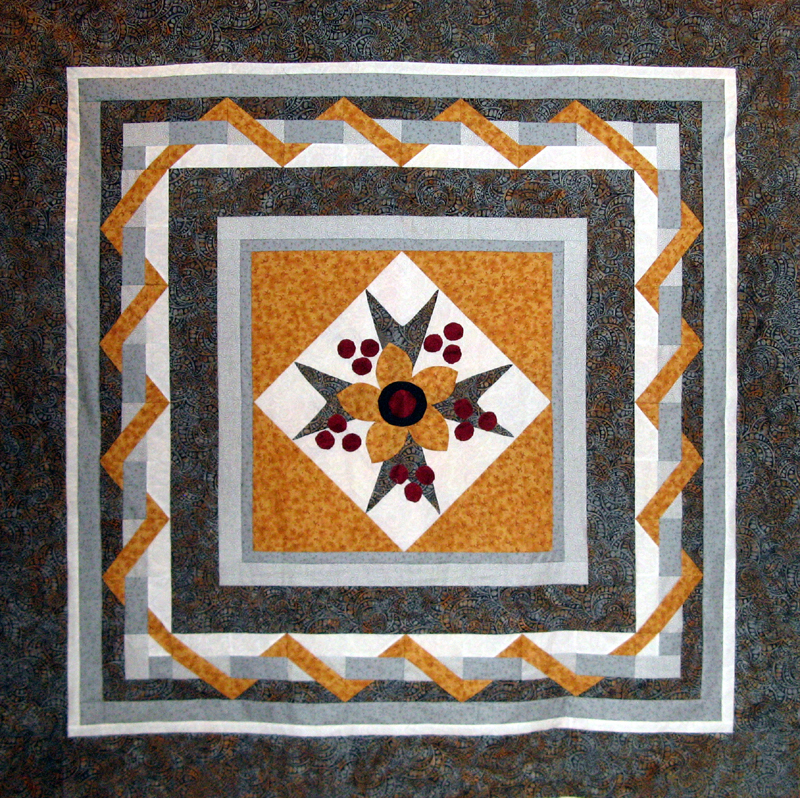 Quiltmaker Quilt-Along 2011 is just days away from going live on Quilters Club of America website. 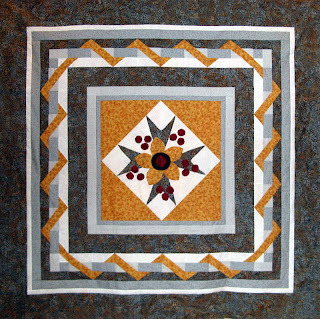 Get your May/June Issue #139 and join the QM Quilt-Along Group as I host the Quilt-Along 2011 Mystery designed by Debbie Caffrey. For more inspiration go to Patchwork Times and follow the links to other quilters' design walls. I've been sewing a bit of everything this week. On Friday I started sewing the QM 2011 Project Linus Make-A-Blanket pattern Dances with Waves from their January/February Issue #137. Here's what's on my table today. I've been asked to do a tutorial on paper piecing (aka foundation piecing) so I'm working on it with this project. 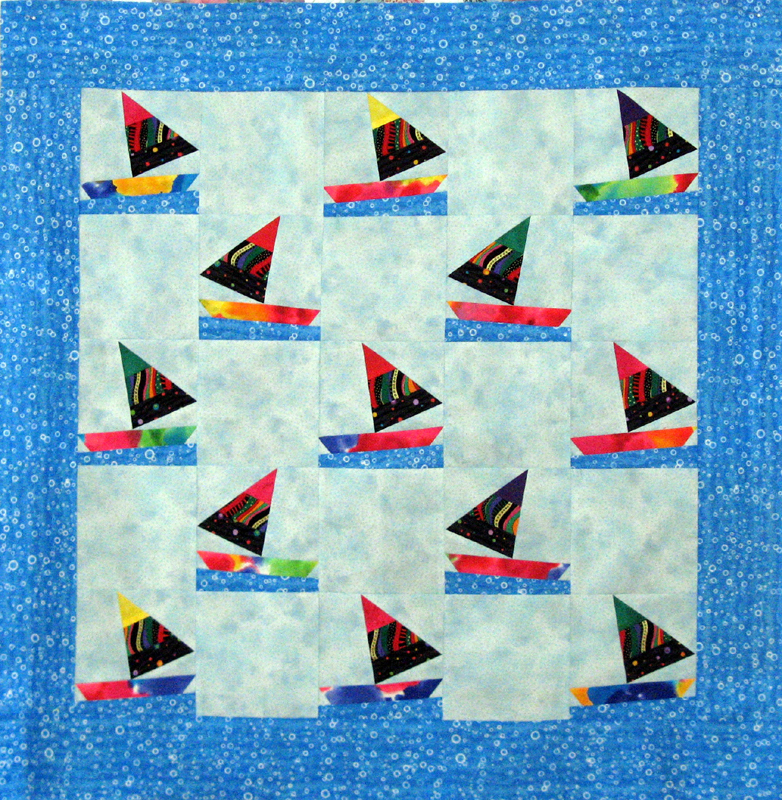 The sail boats are a good starter project for foundation piecing. I know I missed the February 11, 2011 Make-A-Blanket Day, but I'm sure my tardiness won't be a problem :)! Kerry's Quilting has my Making Ends Meet project in her queue. I selected a thread in a bright yellow and a cute all over wild animal jungle pattern for the stitching. I'm planning on a scrappy binding with two fabrics that are in the quilt top. It's going to be really cute when it's finished. So for my report this week. Nothing to claim used for the week. 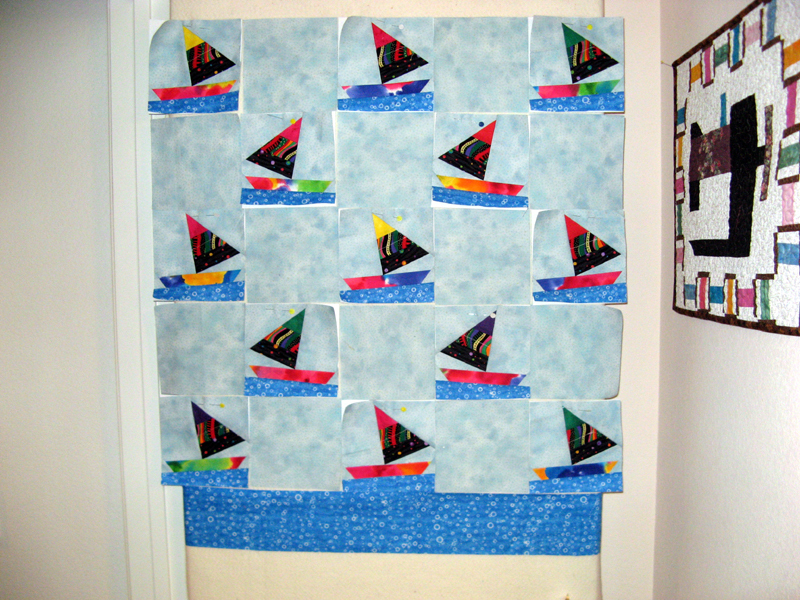 A yard purchased for the Dances with Waves project...it's that medium blue with the "bubbles" for the water under the sail boats and borders. I'll be claiming used next week for this project as I intend to have it done by then. Happy April Fool's Day... Don't let anyone pull one over on you today! Patchwork Times selected #4 for April's 2011 UFO Challenge. At first glimpse it looks to be a bit easier than those before it. This is another Claudia Hasenbach design. I'll be giving it more scrutiny today along with the start of fabric selection. Today I hope to finish my Sunshine Quilt Guild's BOM that is due on in about two weeks. I also will be working on cutting the pieces of Cozy Quilt Shop BOM called Building Blocks and who knows what else. It's my OFF Friday and I'll be taking advantage of it. If you want to be inspired by other UFO completions go to Patchwork Times for a real treat. Enjoy your April Fool's Friday.